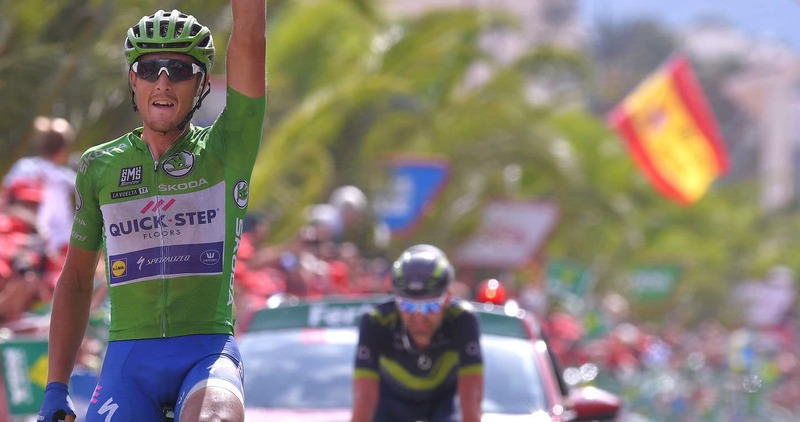 The Italian netted Quick-Step Floors’ 14th Grand Tour victory of the season and reclaimed the green jersey. Matteo Trentin powered to another spectacular win at the Vuelta a España, exactly one week after opening his account at the race, in Tarragona. This time, the 28-year-old came out on top in the Murcia region where he arrived at the finish together with Jose Joaquin Rojas (Movistar) and outsprinted the Spaniard with ease, taking not only the victory, but also the green jersey, which he’ll wear tomorrow for the sixth day at this edition. The race resumed Tuesday afternoon with a 164.8km stage between Caravaca Jubilar and ElPozo, which had to wait for more than 80 kilometers to be covered before a breakaway finally formed. When this happened, Quick-Step Floors duo Niki Terpstra and Matteo Trentin were there, part of an 18-man move which quickly gained five minutes over the peloton led by the red jersey’s team. Everybody knew that the day’s critical points will be the first-category climb of Collado Bermejo (7.7 kilometers, 6.5%) and the subsequent downhill, where narrow, twisty and treacherous roads awaited the riders, so the status quo soon went up in smoke and the group disintegrated as a result of several attacks. Distanced, Matteo linked with Niki Terpstra on the first slopes of the ascent, and the former Paris-Roubaix winner paced him before the Italian upped the tempo and bridged to the leading trio. The four crested the top of the climb with a 30-second gap over their former breakaway companions and on the descent they even managed to extend that advantage before the group split under Rojas’ impetus, who tried to go solo. Only Trentin could take the wheel of the home rider and the two changed turns at the front, so by the time the terrain flatted out, it became clear they will contest the win on stage ten. Matteo led under the flamme rouge, but soon Rojas moved to the front and opened the sprint, with 400 meters remaining. The Quick-Step Floors rider patiently bided his time before coming out of his opponent’s wheel, surging past the Spaniard and kicking out a devastating acceleration, which propelled him to his fifth Grand Tour victory. “I was thinking of this stage for a while now and the plan was to get in the breakaway, knowing there was a solid chance it could stick. I knew the last climb was a hard one, but I rode my own tempo and then, in the downhill, I just followed Rojas, aware he is a good descender and also that he knows the roads, being from Murcia. I am really happy with my second win here, our team is having a fantastic Vuelta a España and we hope to add other good results to our impressive tally in the next stages”, Matteo said at the finish, following Quick-Step Floors’ 14th Grand Tour victory of the year. A few minutes after Matteo Trentin celebrated his emphatic victory, the overall contenders arrived to the line, and David De La Cruz retained his sixth place in the overall standings, which could witness some important changes on Wednesday, when the peloton will take on the Calar Alto climb (15.5 kilometers, 5.9%).